TEN hardy RS Aeros were undeterred from travelling by a forecast of ‘Lundy,….Storm 10 later’ as Storm Ewan was due to make landfall on the Cornish coast and threatened to rip up the English peninsula wreaking havoc across Roadford Lake perched behind its dam wall on the rolling foothills of Dartmoor. 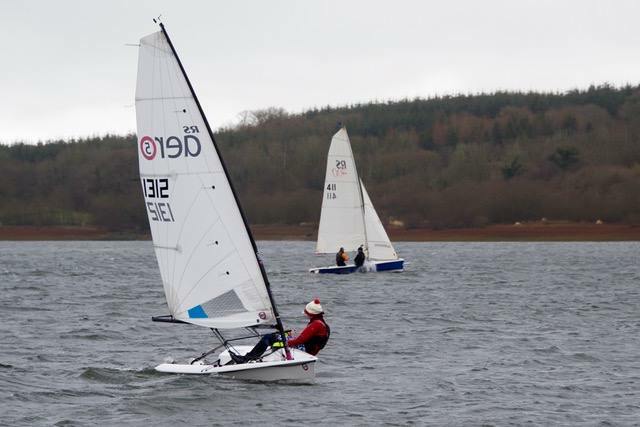 Sensibly, race officer Richard Willows had brought the start forward and shortened the race in advance, allowing competitors to finish and pack away before the worst hit. 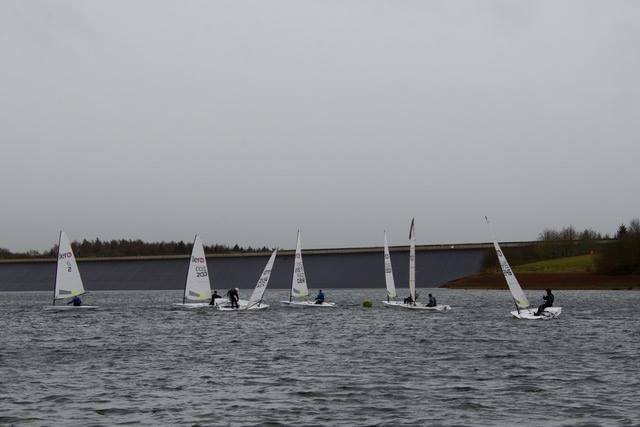 An impressive 40 starters and 30 finishers were rewarded by an awesome sail in a ‘Fresh, but not too Frightening’ breeze on what was a relatively warm morning. As a two-hour pursuit race it was to be a true hare and hounds chase. 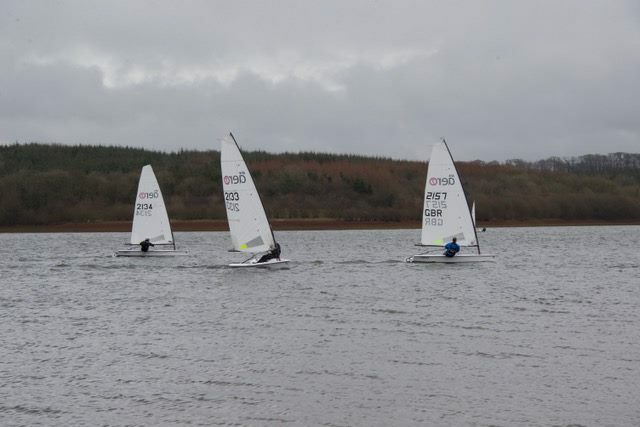 The two RS Aero 5s started with the Lasers, 4 minutes after the Solos, and the 8 RS Aero 7s in pursuit 5 minutes later. The Supernovas had just a 1 minute lead on the ‘7’s and the Blazes were just 3 minutes behind. With the breeze up any trapeze boat who could keep it clean was in with a good shot and revving up on the shore were Fireballs, Ospreys, Hornets and RS 400s who would all start close together. It was hard not to have one eye on your rear view mirror and the other on a watch, willing for the 13:30 finish to save you from being devoured by the chasing pack. Andrew Frost (Sutton Bingham) in his RS Aero 5 nailed his start and led the 5s and Lasers up the first short beat to the dam. The biggest start of the day was the RS Aero 7s with 8 boats and it was Greg Bartlett (Starcross) who flew off the line to lead untroubled for the first lap. Ben Rolfe (Burghfield) steamed down the run and into 2nd place. With the wind blowing down the length of the lake it was a 3,000 meter beat back and the seasoned legs of Peter Barton (Lymington), aided by a whopping Cornish cooked breakfast, that hiked past the youngsters to take the lead and steadily extend for the rest of the race. The 5s of Andrew Frost and David Mahoney (Lymington) had a close tussle throughout but Andrew came through (and also beat his father, Richard, in his Solo!). Greg won the close battle against Ben to edge into the top ten overall. Peter worked hard to get by the lead Supernova and Lasers to take 3rd. When the fat lady finally sang at 13:30, two Fireballs revelling in the conditions were at the front with Chris and Jon Gill well ahead for the overall win - enjoying a rematch after the Stacross Steamer! Borrowing a ‘7’ for the day Dan Bridger (Salcombe) was happy not to be on his ‘9’ and came in 4th RS Aero with first timer Darren Roach (Royal Navy) a commendable 5th. 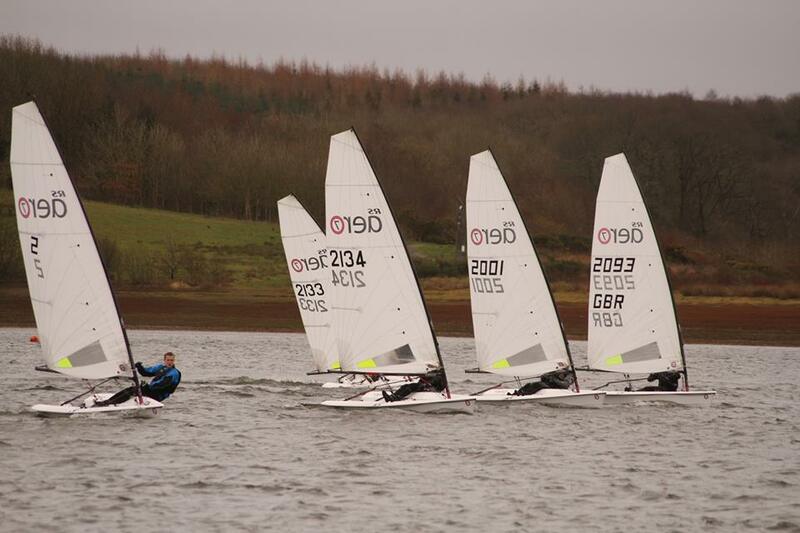 Another RS Aero first timer in that breeze was Roadford’s Kevin Reed who finish 1st home boat overall. The Roadford Rocket doubled as Round 7 of the RS Aero UK Winter Series and with just the final two legs to go at Wimbleball, Exmoor, (19th March) and the grande finale RS Aero Spring Champs at Island Barn, West London, (25th March) the series remains wide open as each competitor only needs their best three from the 10 events to count! Thanks to all the members at Roadford Lake who put so much effort into putting on a successful event. Photos by Alan Williams and Robert de Glanville. A full album is on Facebook HERE.